After the fruitful outing with the kids of Darul Ihsan the other day, I brought my angels for ice cream at The Island Creamery. 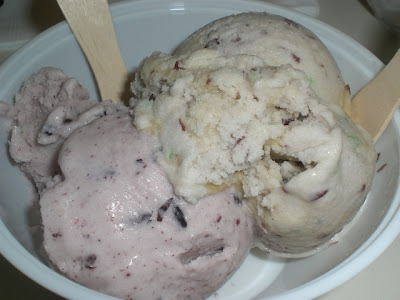 I read and heard alot of rave reviews about this ice cream place so definitely had to check it out. I neednt think hard of what flavours to choose coz I had at the back of my mind what I wanted. Tihani chose Nutella flavour in a cone. And Auni and I shared a double scoop of Teh Tarik and ReversO. I enjoyed both very very much. The Teh Tarik is to die for .. really .. kidding am not! Aint that sweet .. just nice! I love it to bits that I almost bought a tub but I managed to control. Will go get them when there's occasion .. definitely! If you think that I was done with that?? You are absolutely wrong! In no time, I found myself back at the counter. I almost got myself the same flavours as before but I had to give the other flavours a chance and so I chose Chendol and Pulut Hitam .. also very nice but I must say nothing beats Teh Tarik and Reverso! 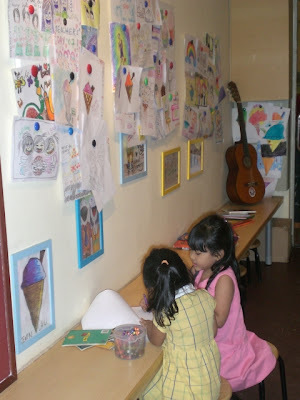 This parlor is kid friendly too .. see the low table and chair where kids can read and doodle .. fun fun fun ..
And yah .. check out their walls .. pictures and pictures of patrons adorn the Island Creamery walls .. So if you're thinking of checking this parlor out, it is open daily from 11 am to 10 pm. 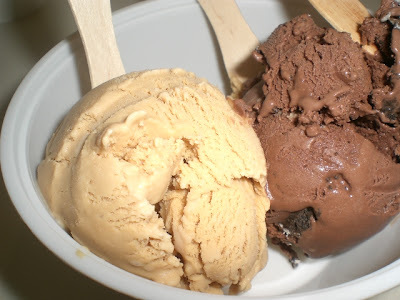 Price per scoop is S$2.50, double scoop is S$4.00 and a 500ml tub is S$8.00. 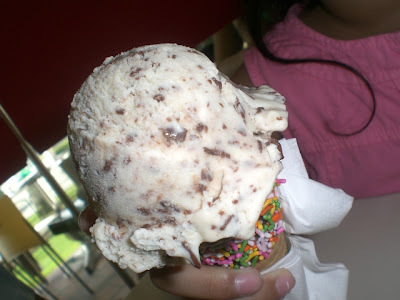 So another ice cream parlor checked and 5 more to go ..
heh nothing beats Teh Tarik and Revers-O eh? i totally agree. the perfect combination! 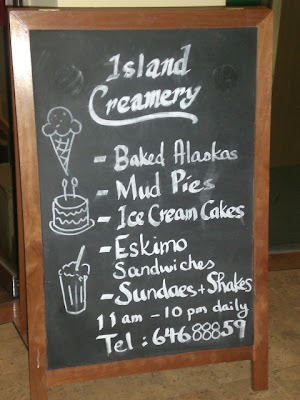 Mmmmm...i miss island creamery. btw, aidil and i think your daughters are soooooo pretty. memang tidak dapat disangkalkan lagik .. memang power to the max! 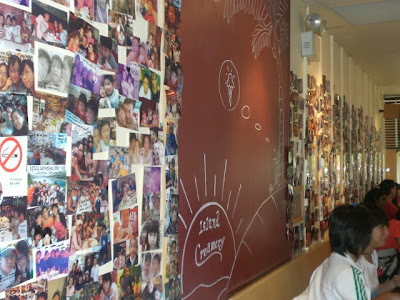 makes me want a teh-tarik ice-cream now... hehe. i shall wait for your review then! was supposed to go daily scoop last sat after i had passed eja the cookies but then changed my mind coz i wanted to save some belly space for lunch at my aunt's. tihani definitely enjoyed her nutella .. licin dia kerjakan .. i only had a chance to taste when i had to lick the melted part.. bad gurl .. dont even wanna share with mama! hmmm...sedap kan?? i feel like going there again! nearly bought e tub but controlled my self=) have u tried e burnt caramel?? must tell u it is soooo sedap!! to lil sis - yes i definitely remember that i owe you an ice cream treat .. perhaps dis sunday ok! to farah - how are u and the cartoons?? 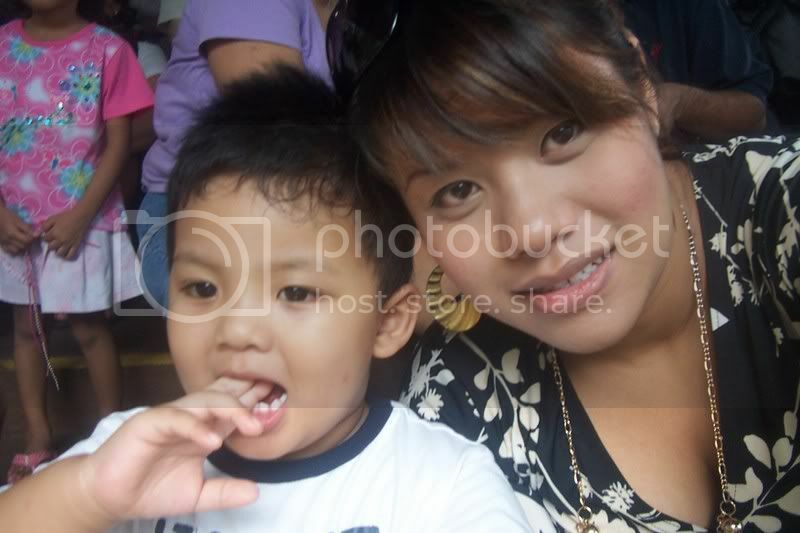 im sure you're enjoying every seconds of your maternity leave rite now. yeah .. we should go together sometime and a treat from me - no probs babe! to anonymous - wah .. u make me wanna try burnt caramel like right now .. nak kena pergi lagik soon lah nie .. erm, btw, siapakah gerangan anonymous nie?? 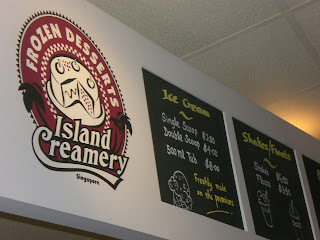 Have been hearing so much about Island Creamery! Why on earth did I type in Thursday? -_-"
you must be so stressed about your mum talking to you abt marriage i suppose and dats why you typed thursday instead of sunday .. LOL ..
yeah .. you've got to try those and review k ..
Hmm, the teh tarek ice-cream seems very YUMMILICIOUS! Heard a lot about it....NUTELLA ice-cream? WOW! I Am In Love .. I Finally Went Out with the Kids!